Dutch design superstar Hella Jongerius’ modus operandi is to design on the basis of a tradition, researching the history of a product, giving it a twist and creating something new. 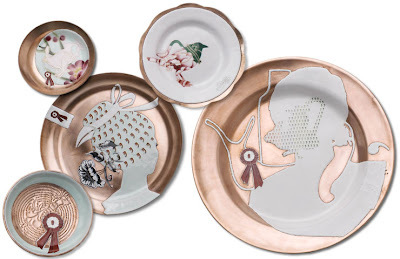 Her latest exploration is with an old enamel technique called Shippo cloisonnÃ©, creating these five Shippo Plates . Shippo cloisonnÃ© is a technique whereby fine silver strips are applied to copper, and then enamel is poured into the spaces, then repeatedly fired and polished. 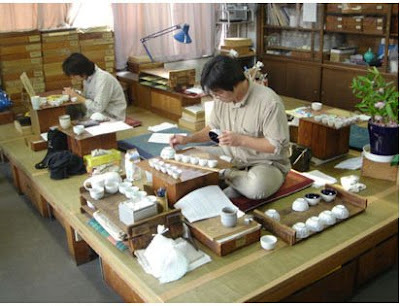 The pic below shows the process at work in the Japanese enamelling studio that produces the Shippo Plates for Tokyo-based company Cibone.